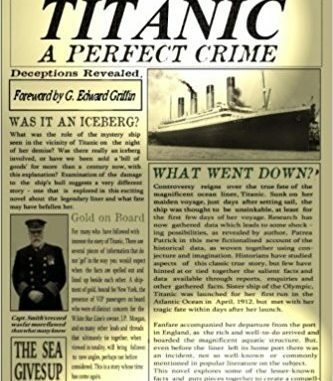 Titanic: A Perfect Crime is a novel by Patrea Patrick that describes one of the theories of how the Titanic sank. The foreward is written by someone I admire a great deal – G. Edward Griffen, author of the finest book on the creation of the Federal Reserve, The Creature from Jekyll Island. His title refers to the former Jekyll Island Club in Georgia. The design of the Federal Reserve Act was hatched at the club in 1910, leading to the passage of the Federal Reserve Act of 1913. There are many unusual facts about the sinking of the Titanic in 1912, two years after the meeting at Jekyll Island and a year before the Federal Reserve Act passed. The ship was owned by the White Star Line which was, in turn, owned by a holding company owned by JP Morgan. Morgan cancelled his passage on the Titanic at the last moment as did a large number of his friends and associates. Three of the richest and most important men to die in the sinking of the Titanic were Benjamin Guggenheim, Isador Strauss, the head of Macy’s Department Stores, and John Jacob Astor, probably the wealthiest man in the world. All three were alleged to be opponents of the Federal Reserve. There are many oddities around the Titanic story that make it worthy of a investigation. If you want a fictional version that dives into a great deal of detail as it unravels the mystery, Patrea Patrick’s novel is an engaging yarn. If you prefer a shorter, straightforward documentary, here is one suggested by a Solari Report subscriber that lays out the important questions and evidence that the Titanic was both a profitable insurance fraud combined with political assassinations. Whatever the truth, based on the evidence, the official story is not possible.